Myanmar lost 5 percent of its tree cover from 2001 through 2014, with rates scaling upward over that time. The ban will stave off logging activity for one harvesting season, leaving the country to depend on its reserve timber stockpiles. Logging activities have been banned in the Pegu Yoma region for 10 years. Legality concerns remain, with conservationists calling for strict controls over stockpiled timber to ensure illegal harvests aren’t laundered through the system. Rumors that have been building for months have come to fruition, with Myanmar announcing a national logging ban effective immediately. Although temporary, conservationists are lauding the ban, which will run until the end of March 2017. Myanmar has seen an uptick in deforestation in recent years, with satellite data from the University of Maryland showing the country lost nearly 5 percent (2 million hectares) of its tree cover from 2001 through 2014. (Note: tree cover includes both forests and tree plantations.) Of this, 2014 saw more than a quarter-million hectares lost – more than any previous year during the study period. According to environmental watchdogs, overexploitation of Myanmar’s forests have been driven by corruption and mismanagement in the country’s timber industry sector. They say the new ban is a big step in the right direction. 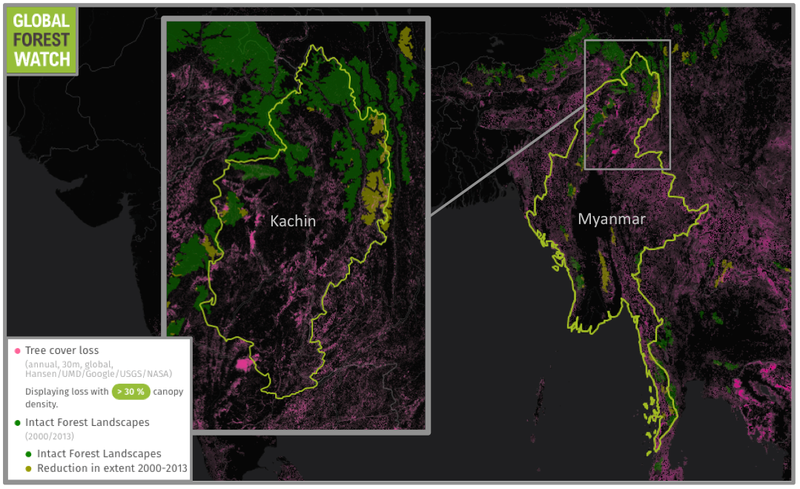 Myanmar lost more than 2 million hectares of tree cover from 2001 through 2014. One of the states most affected by logging is Kachin, which lies along the country’s northeastern border with China. The state contains some of Myanmar’s most extensive intact forest landscapes – particularly large, continuous tracts of primary forest – home to endangered Indochinese tigers (Panthera tigris corbetti). With the main brunt of logging taking place in Myanmar from August through March, the ban effectively stops one season of harvest. However, with a current stockpile of around three years’ worth of timber, the country has enough reserve to satisfy demand. 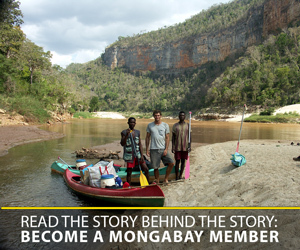 These stockpiles will be managed by the government-controlled Myanmar Timber Enterprise. However, the country’s timber industry has historically shown something of a disregard for legality concerns, with a 2014 EIA report finding 72 percent of log exports out of the country from 2000 to 2013 were illegally harvested. In a statement issued today, EIA stressed the importance of implementing controls that would ensure illegally harvested timber isn’t laundered through Myanmar’s stockpiles. Myanmar previously enacted a ban on raw timber exports in 2014 in effort to stem pressure on its forests. But the ban’s exclusion of milled timber raised eyebrows in the conservation community and led to a flurry of new lumber yards as those in the industry sought to take advantage of the loophole. A big driving force of Myanmar’s illegal timber trade is demand from China, with Myanmar becoming China’s biggest supplier of rosewood in 2013. Such demand is implicated with the decline of rosewood species, with several considered endangered. The trade in illegally harvested timber across the Myanmar-China border declined in 2015 as China’s economy slowed and Myanmar’s government changed hands. Currently, China’s timber trade with Myanmar is officially suspended. Header image is of an Indochinese tiger taken by Lotse and used via Wikimedia Commons (CC 3.0).